British Columbia is blessed with an abundance of lakes found throughout all areas of the province. In particular, the central and southern interior regions of B.C. are well endowed with small highly productive lakes that offer tremendous trout fishing opportunities matched by very few other places in the world. Learning how to successfully fly fish these rich natural resources will add to your outdoor experience. The first lesson to learn is understanding where trout live in a lake. It is often said that trout are a lot easier to locate in rivers and streams because of the easily distinguished habitat structure of pools, riffles, runs and flats. 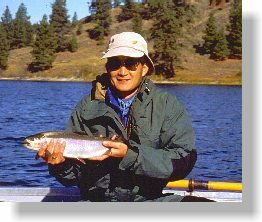 Lakes on the other hand, do not show their internal structure as easily and trout are not under the influence of current, which in moving waters dictate where they can live. A typical small lake is shaped like a shallow soup bowl. Shallow water extends out from the shoreline and gradually gets deeper until reaching the deep section or "bowl" of the lake. The transition zone between shallow and very deep water is called the "drop-off." Each part of the lake plays an important role in the overall ecology of the water body. The shallow water/shoreline area where water is less than 0.5 metres deep is very productive aquatic invertebrate (bug) and juvenile trout habitat. This very shallow zone is often overgrown with aquatic vegetation which provides the habitat for fish and fish food. Larger trout do not often venture into this very shallow water as they are very vulnerable to predators and for most of the summer months this water is too warm to stay in for any length of time. As this shallow zone deepens to approximately the six to 8 metre depth it is referred to as the shoal or littoral zone. Sunlight or photosynthesis can penetrate to the lake bottom at these depths. The actual amount of shoal area in a lake is determined by the clarity of the water. Clearer water means deeper sunlight penetration. Light penetrating to the lake bottom allows green plants to grow which in turn provides habitat for both trout and their food sources (insects). Common aquatic plants found growing on the shoals of interior lakes include chara, milfoil, potamogeton, longstem bulrush, cattails and lily pads. Therefore, it is safe to say that the majority of trout feeding activity occurs on the shoal or at the edge of the shoal (the drop-off). In clear water lakes the drop-off is easily identified as that zone where you can no longer see the bottom. This transition zone offers good fish and fish food habit as photosynthesis is still occurring and it also provides deeper, cooler water for trout to escape to during the hot summer months when the shallower shoal zone becomes too warm during the daylight hours. The deep water zone refers to that portion of the lake that is generally greater than 8 metres deep. Most small interior lakes are less than 25 metres deep although some of the most productive and best known fishing lakes have maximum depths of less than 10 metres. 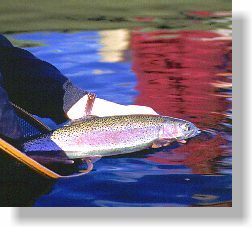 The deep water zone is an important feeding area for trout during spring chironomid hatches and late fall Water Boatman and Backswimmer mating the swarming flights. 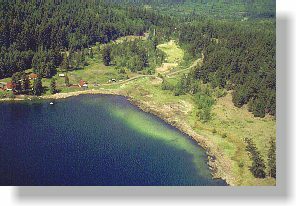 During the warm summer months, in many lakes, the deep water zone is poorly oxygenated and not good fish habitat. As mentioned earlier, the best insect/invertebrate habitat is found in the shallow water zone through the shoal to the edge of the drop-off. Let's have a closer look at what types of food sources live in these habitat zones. The staple diet of trout in productive interior lakes is freshwater shrimp. These small members of the crustacean family require calcium rich water to maintain their chitinous exoskeleton. Shrimp live among the lush vegetation found in the shallow water/shoal zones of the lake. Trout can feed on shrimp at any time of the year. Chironomids or midges are the first big insect hatch of the year. Chironomid larvae live in the mud at the bottom of the lake in very shallow to very deep water. The most abundant hatches occur in water less than 10 metres deep. The chironomid hatch is the most prolong emergence of the year. Trout love to feed on the pupa as they rise to the surface to emerge into the adult. Chironomid pupa range in size from two to 25 mm in length. Common pupal colours include black, green, brown and maroon. Mayfly nymphs seek cover in the submergent and emergent vegetation found on the shoal of the lake. When fully developed the nymphs swim to the surface of the lake to hatch into mayfly dun. Trout feed intensely on the nymphs as they swim to the surface of the lake and on the newly emerged duns. Mayfly nymphs adapt their colour to that of the habitat they are living in. Damselfly and dragonfly nymphs prowl the bottom of the shoal and drop-off in search of a meal of shrimp or mayfly nymphs. Both of the nymphs are long-lived and available as trout food throughout the year. Mature damselfly nymphs swim off the bottom to within a metre of the surface and then swim horizontally toward a cattail or bulrush patch to emerge as the adult. Trout as well as observant anglers will see this migration. Mature dragonfly nymphs crawl along the lake bottom to shore to emerge as adults. Caddisflies are identified as being present by the intricate larval cases or houses built out of bits of vegetation or particles of sand. Larvae graze on vegetation and detritus found on the bottom of the shallow water/shoal zone. The pupal transformation occurs within the larval case. When fully developed the pupa cuts its way out of the old larval case and quickly swims to the surface of the lake. The adult caddisfly emerges and scampers across the water in an attempt to get airborne. This provides some of the most exciting dry fly fishing of the year. Water Boatman and Backswimmers are air breathing insects that form swarming or mating flights in the late fall. Large numbers of these insects will dive into the lake to deposit eggs. Trout will feed on these insects in all depths of the lake. Watch for these sudden "rain showers" on bright cloudless days in late September and early October. Understanding lake structure and the biology within the water are both fascinating and important to becoming a successful lake fly fisher.